Work continued this week on the holy water, as we turned our attention to the two remaining versions needed. One is a “dull” version for Act 2, and the other is a “boiling” version for Act 4. NR and I went back and reviewed a couple of AVIs that could work for these animations, and he started the work on converting them to PNGs and IFLs. He created first pass versions of the DTS shapes with the animations, and so far so good. We’ll need to continue the work on them to refine the look and feel, but hopefully all that should be done in the next week or two. The rest of my time was spent fixing old issues and adding new functionality. The new functionality is the PRAY FOR command, which was relatively straightforward since there aren’t too many valid targets for that command. As for the fixes, there were a few: the response to the EAT HARE command in Act 1 is now correct, the background events (wind, wolf howl, voices, etc) are now delayed at the beginning of Act 2, and we now allow for skipping the “Act 2” text when it is displayed on the screen. Finally, I started going back to make needed fixes to Constantin’s voice recordings for Act 1 (to provide proper synchronization with the animations), as well as minor tweaks to Drogo’s Act 1 animations, which could use a little spicing up. 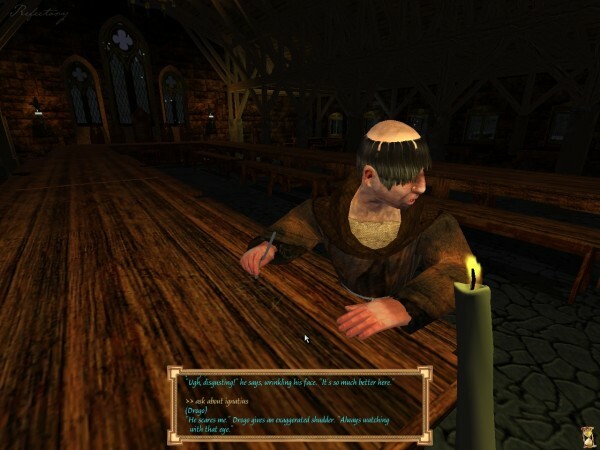 This week’s screenshot shows Drogo during Act 1, responding to a question about Ignatius. How do you feel about Ignatius, Drogo?